A shooting attack on an Iranian military parade in Ahvaz in the country’s south west has killed 24 people and injured 53, state media reports. Of those killed, at least eight are believed to be members of Iran’s elite Revolutionary Guard. Women and children who had come to watch the parade were also caught up in the attack. State-run news agency IRNA reported gunmen were dressed in guard uniforms and targeted a platform where military and police commanders were sitting. 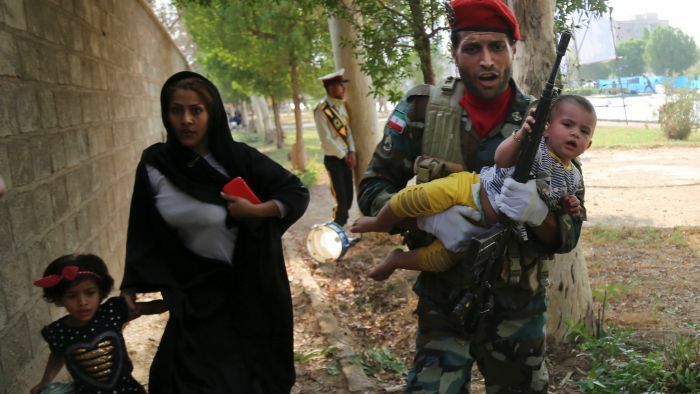 No group immediately claimed responsibility for the assault in Ahvaz, which saw gunfire spray into a crowd of marching guardsmen, bystanders and government officials watching from a nearby platform. The annual parade marks the start of the eight year war with Iraq in the 1980s. Iran’s Foreign Minister, Mohammad Javad Zarif, has blamed regional countries and their “US masters” for the attack. It coincided with remarks by Iranian president Hassan Rouhani, who said that US president Donald Trump will fail in his confrontation with Iran, and vowed Tehran will not abandon its missiles. On Twitter, Mr Zarif warned that: “Iran will respond swiftly and decisively in defence of Iranian lives”. He also said children and journalists were casualties in the attack and added that the gunmen were “terrorists recruited, trained, armed and paid by a foreign regime”. He did not immediately elaborate, however Ahvaz is the capital of Iran’s oil-rich Khuzestan province and has seen attacks on oil pipelines by Arab separatists groups.